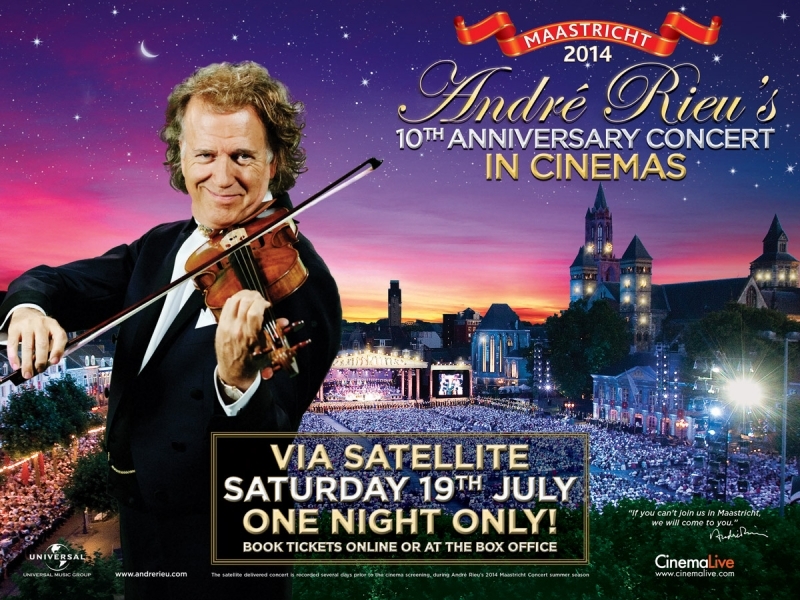 Help celebrate the 10th Anniversary of André Rieu's traditional summer evening concerts, staged on the most romantic city square in The Netherlands: the Vrijthof in Maastricht. Be prepared for emotions to soar, during one of the most extraordinary concerts of the year as the maestro puts on a magnificent spectacle during this very special anniversary edition of his much-loved concerts. The dramatic and alluring medieval square will be transformed into a romantic open-air concert, featuring André and his famous 60 piece Johann Strauss Orchestra, along with many famous guest artists, soloists, light shows and spectacular fireworks. André said: "My 10th Anniversary hometown concert is very dear to my heart and I wish everyone could be here to help us celebrate. However, if you can't join us in Maastricht, I hope I can touch your heart by bringing this special evening to you, on the big screen in your local cinema." The concert is approximately 2hrs 40 mins including a 15 minute interval, with spoken parts in Dutch (with English subtitles) and English.